Will Mark Hamill's active campaign against sitting President of the United States Donald Trump hurt Star Wars: The Last Jedi's changes at the box office? Not likely, as it's currently posed to be the biggest movie of the year. But some will possibly grow a little weary of Hamill and other celebrities coming at the Potus so vehemently, whether it is deserved or not. The latest campaign finds independent like-minded Americans gathering to buy out Twitter and ban Donald Trump, who notoriously uses the social media platform obsessively, perhaps a little too much, when he should be focused on, perhaps, other issues facing the country. Mark Hamill has been clear that the move to buy Twitter is a purely satirical one. It was started on GoFundMe, and the money is going to a good cause. The grass roots movement sees a member of the crowd-funding site trying to privately buy out Twitter for the sole purpose of having Donald Trump banned from the platform. Mark Hamill simply thinks this idea is too delicious to pass on. You can check out the campaign at Go Fund Me. The goal is to raise $1 billion dollars. The campaign is already at $82,850 and counting, with the money raised by 2,757 people over the past 11 days. As more people have become aware of this campaign, it has taken on a life of it's own. Mark Hamill says this about joining the movement. "Let's #BuyTwitter and #BanTrump! With my #ArmageddonAnxiety growing daily- I donated gladly! #GoodLuckValerie. #BuyTwitter is symbolic & satirical (Raise $1B? LOL!) Plus-I WANT him to keep tweeting-it's all admissible evidence for #TrumpRussia/Mueller"
So, yes, this is all a joke. Valerie Wilson of Santa Fe, New Mexico kicked off this satirical campaign, which is starting to spread like wild fire. The woman is a former CIA member who focused on nuclear proliferation issues. She claims that Trump is using Twitter as a matter of life and death. She says this about launching such a campaign. "Donald Trump has done a lot of horrible things on Twitter. From emboldening white supremacists to promoting violence against journalists, his tweets damage the country and put people in harm's way. But threatening actual nuclear war with North Korea takes it to a dangerous new level. It's time to shut him down. 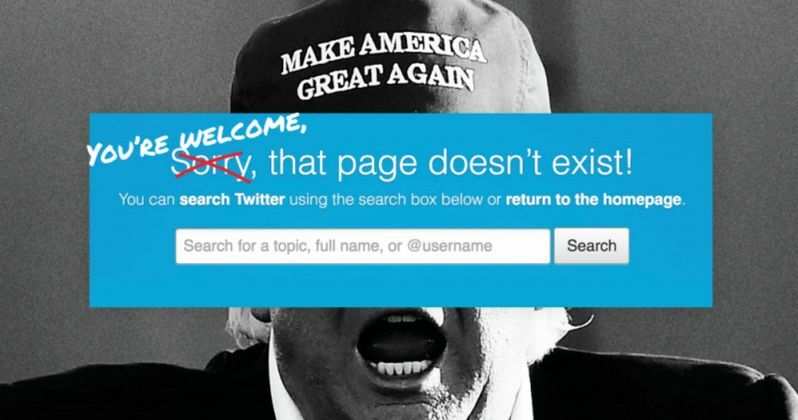 The bad news is Twitter has ignored growing calls to enforce their own community standards and delete Trump's account. The good news is we can make that decision for them. Twitter is a publicly traded company. Shares = power. This GoFundMe will fund the purchase of a controlling interest in Twitter. At the current market rate that would require over a billion dollars, but that's a small price to pay to take away Trump's most powerful megaphone and prevent a horrific nuclear war. She goes onto say this about how Trump has weaponized Twitter, and what exactly the money being raised will go towards. "If we hit this goal, we'll use it to become Twitter's single biggest shareholder and leverage that position to enforce its rules against violent threats, intimidation and hate speech, and shut down Trump for good. If we don't hit that target but raise a lot of money along the way, we'll use that demonstration of public support to pressure Twitter to take action, and 100% of the proceeds will be donated to Global Zero, a nonprofit organization leading the resistance to nuclear war. (No matter what, I won't keep a penny of these funds or benefit financially in any way.)" Many will argue that this goes against free speech, while equal sides will point out that Trump is banning people left and right from looking at his Twitter. Just this weekend, Stephen King banned Trump from seeing his upcoming big screen adaptation IT and his new TV show Mr. Mercedes, though it is unclear how he'll do that. Both Stephen King and Mark Hamill are some of the loudest outspoken critics of POTUS Trump. While the President has been criticized about his use of Twitter, quite a few people have complained about being blocked. So some are enjoying it, even if they pretend to hate what he is doing. Some simply can't look away. But this is all a very interesting way to express thoughts and feelings about a hot button issue. In all likelihood, Twitter won't be bought out, and Trump will continue Tweeting all the way up to his possible second term in office.